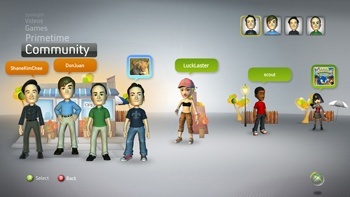 Microsoft is apparently planning to update the appearance of player avatars on Xbox Live to make them more realistic. Since they were introduced on Xbox Live, avatars have proven incredibly popular with gamers, thanks in large part to the high amount of customization available. Not only that, but it's proven a highly profitable feature for Microsoft, as a lot of people are willing to spend a couple of bucks buying some favorite clothes/accessories for their avatar. However, the cartoony looks that we've grown to know and love are apparently going to be a thing of the past when Kinect launches later this year. Official Xbox Magazine spoke to Nick Burton, a "senior programmer at avatar creators Rare," who said that the updated look will make avatars more realistic and has nicknamed the appearance update, "Avatar 2.0." Apparently the new avatars will be more realistic because hand-eye coordination "broke" (on the part of player perception) when using Kinect with the exaggerated proportions provided by the current generation of avatars. Exactly what broke down wasn't explained. I actually enjoy the cartoony look the avatars have and don't have an overwhelming desire to see them get more realistic. That said, I'm trying to withhold judgment until I actually see an example of how these changes will manifest themselves. In the meantime, I'm just holding out a faint hope that we'll have the option of retaining our beloved cartoon-like avatars if we don't bother picking up a Kinect.